Family fun that is affordable and practical? 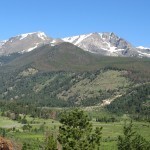 Snow Mountain Ranch YMCA in Granby, Colorado is all that and more. As a mother of four children ranging from the ages of five to fifteen my husband and I are always looking for family vacations that are thrifty, without being boring. As luck would have it a fabulous deal became available through Groupon.com (for a fraction of the regular nightly rate) for the YMCA resort in Granby, CO, which looked to be a great way to spend fall break. 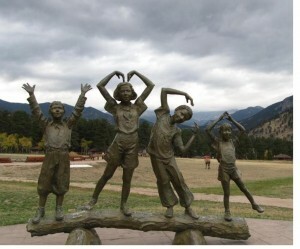 My husband and I checked out the YMCA of the Rockies before making our purchase and were immediately hooked with their list of activities that were listed FREE of charge for their guests. Namely; miniature golf, roller-skating (with old school four wheel skates or bring your own in-lines), basketball, pool table, foosball, playgrounds (even a small indoor one by the pool table), swimming, hiking, a history tour complete with a preserved ranch of the original family settlers and so on. Other activities that are just a few dollars a person; you can participate in an hour of archery with full instruction from a trained instructor. There are zip lines and wall climbing for those wanting a bit more adventure. Plus, a large craft building where you can create treasures of all sorts, including leather works and jewelry making. We never stopped; never heard the well known kid phrase, “I’m bored”. We all had a great time together. So much so, that it would have been well worth paying full price. We will return again, for longer next time and in the summer. Serena is a wife and mother of four, three boys and one girl. She earned her Bachelor of Science degree in University Studies of Communications and Marriage and Family Studies, with a cluster in History from BYU-Idaho. She enjoys reading, dancing, running, biking and sewing. Most of all, she loves being with family and friends. After reading your review, we went and checked it out to see the zipline, and ended up buying a family membership. Lots of fun activities to do there! Thanks! I am thrilled to hear!!! We are heading up for week again later this summer and can’t wait, so glad your family will be enjoying it as well.